From road trips to camping to throwing the frisbee at the park, summertime is when people come out of hibernation to enjoy the sunshine, which sometimes leads to fatigue and injury. Yet there are easy steps you can take to help ensure a safe, healthy, and fun summer for you and your loved ones. With summer just around the corner, it’s crucial to consider ways to maintain optimal health, while remaining active in all your summer adventures. At Arne Wellness Center, we want to help you enjoy your summer to the fullest. 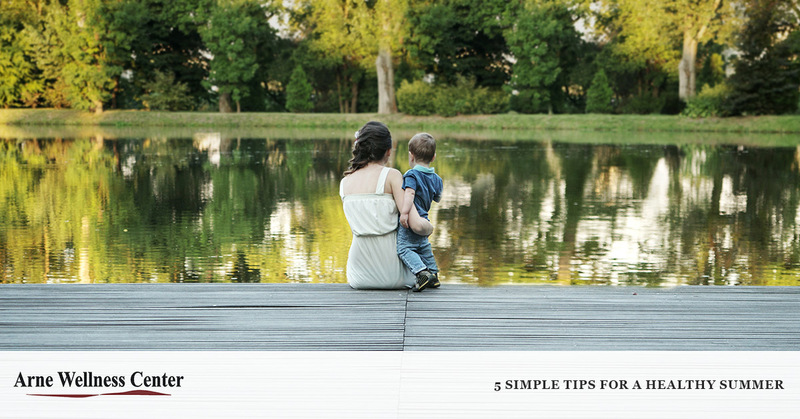 We’ve compiled a list of five simple tips to help you and your family stay healthy all summer long. Between extra hours spent basking in the sun, scorching temperatures, and increased physical activity, water is the key to maintaining energy while fighting heat exhaustion, fatigue, and dehydration. Bring water bottles with you everywhere, even on quick trips to the store. You don’t want to get caught in traffic on a scorching day with no water. Want to keep your water cold? Try filling up your water bottle and freezing it before you head out. You’ll have cold water that lasts for hours! Also, be sure to pack extra water for your furry friends, even if it’s a quick trip. Hot dogs, bratwursts, and bacon cheeseburgers are staple summertime foods. While these foods are delicious, they’re high in fat, cholesterol, and calories. Be sure to get your fill of tasty fruits, vegetables, and grains to help maintain a healthy, balanced diet that fuels all your adventures. Head to the farmer’s market and pick up some fresh local fruits and veggies that are sure to pair well with those yummy barbecue dishes. You’ll also get your fill of energy and immune-boosting essential vitamins, minerals, and antioxidants! From yard work to backpacking and everything in between, summertime is a prime time for heightened activities. Before heading out on your next physical activity, be sure to stretch those muscles! To avoid injury and muscle fatigue, it’s best to stretch properly before and after each activity. Here is a simple guide to basic stretches to help! Get outside and enjoy the sunshine! Whether it’s gardening or climbing a Fourteener, it counts as exercise. Bored with the same old workouts? Try something new! For instance, if you’d rather be outdoors than in a gym, try taking your fitness routine outside or doing yoga in the park. Even doing something as simple as riding your bike for 30 minutes at a regular pace can help boost your energy while promoting increased circulation. Just remember to stretch! Also, be mindful of your time spent in the sun. While sunshine provides vitamin D that is great for your health, be sure to load up on sunscreen. Experts recommend reapplying sunscreen throughout the day to protect against harmful UV rays. With all of your awesome adventures planned for this summer, remember to schedule regular chiropractic appointments to help maintain optimal health and wellness. At Arne Wellness Center, we’re here to help our patients achieve health and wellness excellence through natural medicine and chiropractic care. Call Arne Wellness Center to learn more about maintaining a healthy summer lifestyle!